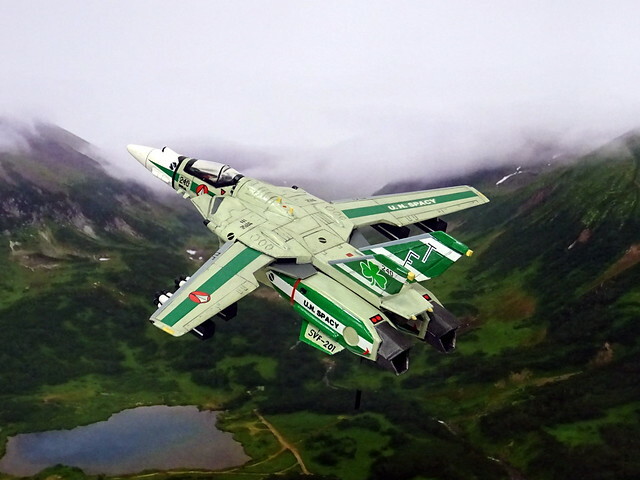 1:100 VF-1J MLU "Valkyrie" ...and it's green! 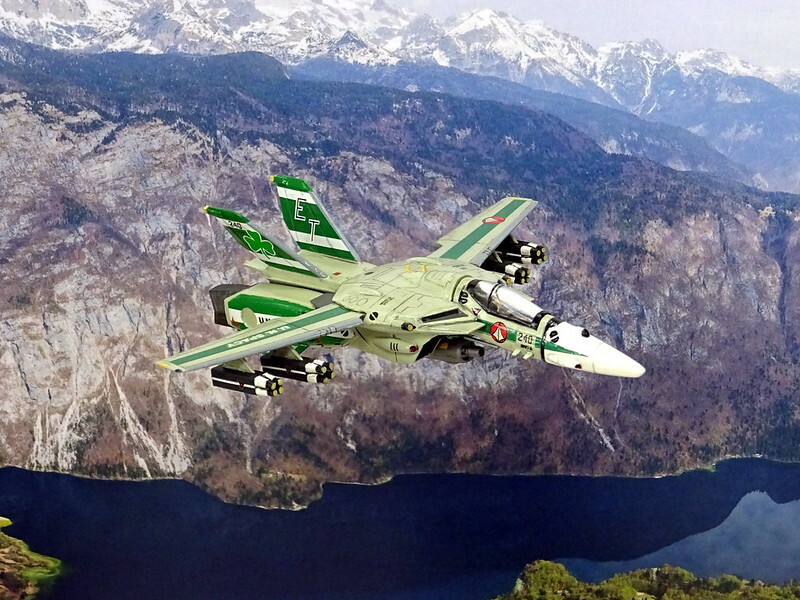 The versatile aircraft also underwent constant upgrade programs. 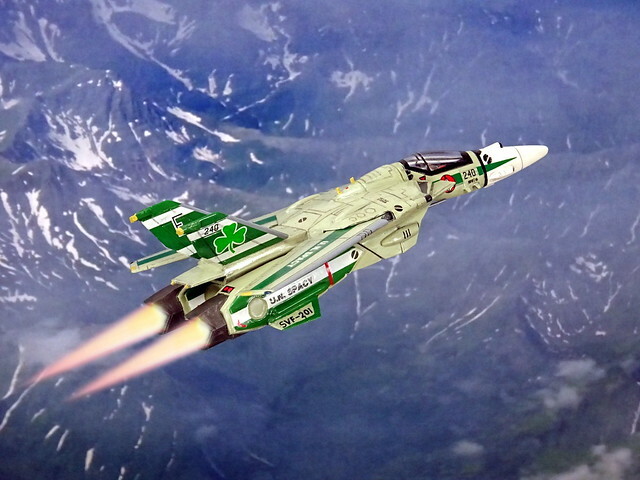 For instance, about a third of all VF-1 Valkyries were upgraded with Infrared Search and Track (IRST) systems from 2016 onwards, placed in a streamlined fairing on the upper side of the nose, just in front of the cockpit. 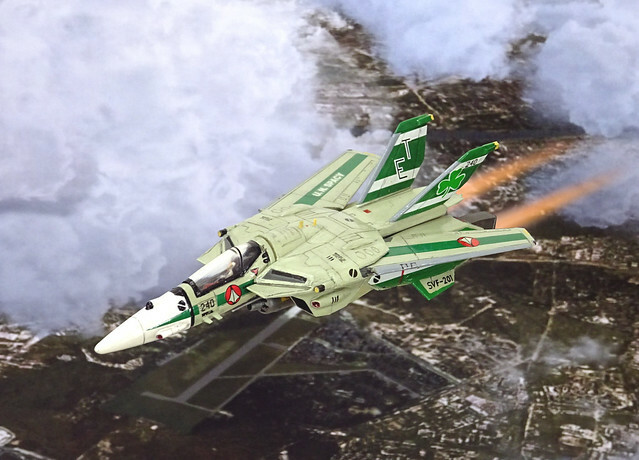 This system allowed for long-range search and track modes, freeing the pilot from the need to give away his position with active radar emissions, and it could also be used for target illumination and guiding precision weapons. Many Valkyries also received improved radar warning systems, with receivers, depending on the systems, mounted on the wing-tips, on the fins and/or on the LERXs. Improved ECR measures were also mounted on some machines, typically in conformal fairings on the flanks of the legs/engine pods. 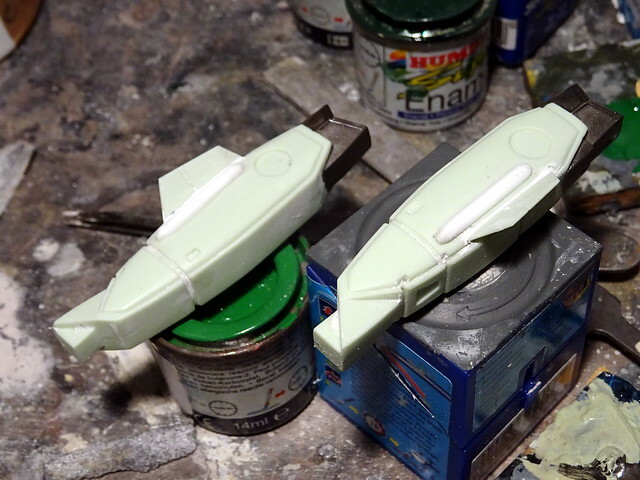 Well, once in a while I dig one of these vintage ARII kits out of the mecha pile and let the spirits flow. This one was a kind of mental distraction, after putting together eight models for the “RAF Centenary” group build at whatifmodelers.com – and it’s the realization of an idea I had maybe 20 years ago when I worked part-time at a painter. 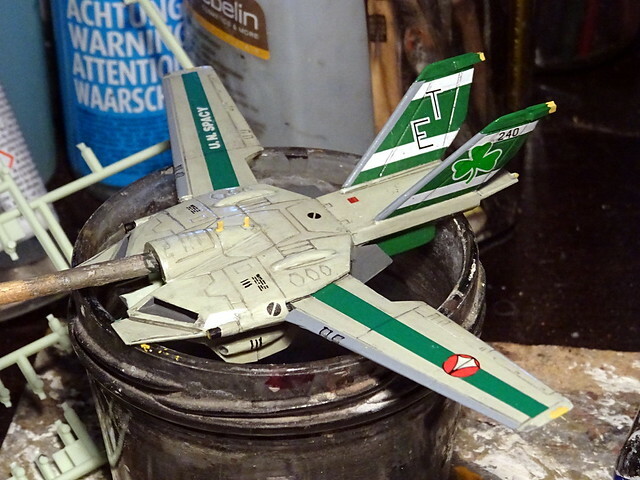 One day I came at a wholesale shop across a rattle can with RAL 1000 (Beigegrün), a kind of yellow-ish RAF Sky and one of the ugliest colors you can imagine beyond RLM02. 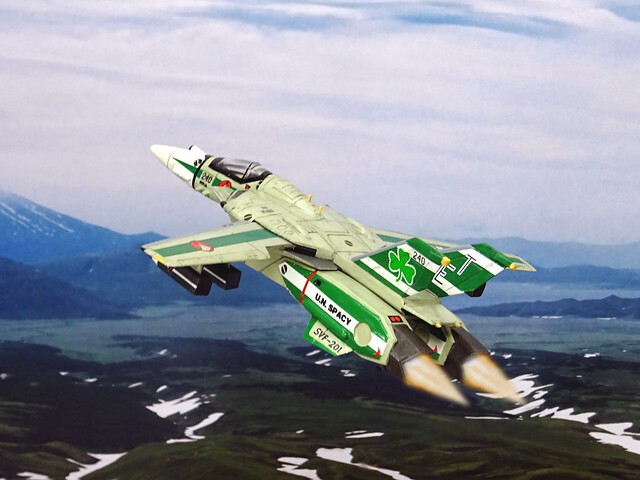 But I thought “One day I’ll try to paint a VF-1 with THIS, and it will certainly not look bad…”. 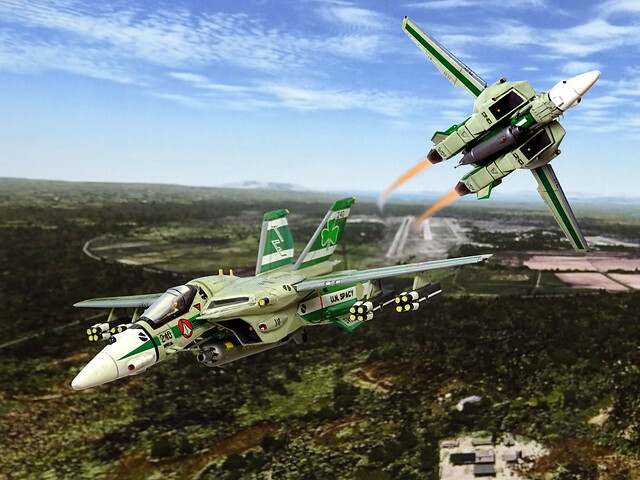 Said and done, the VF-1J remained basically OOB but received some mods and updates. 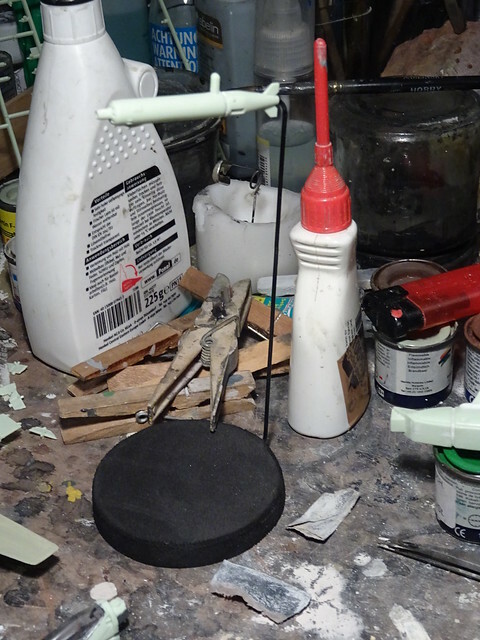 First of all, the kit was to be displayed in flight, with its wheels tucked up, so I added one of my home-made standard display stands to the gun pod. 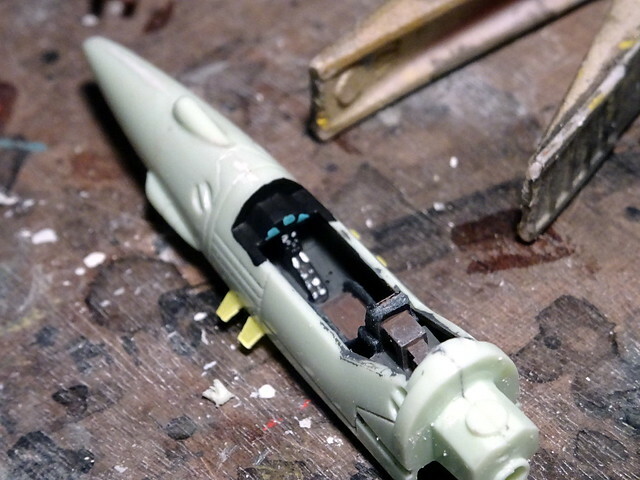 Then the kit received, as a standard treatment, some characteristic blade antennae on the back and the nose which the kit simply lacks, due to the small scale and its simplicity. Then came some cosmetic additions – partly canonical, partly fictional. The IRST fairing in front of the cockpit as well as the sensor mounted on the wing roots were inspired by official source material. 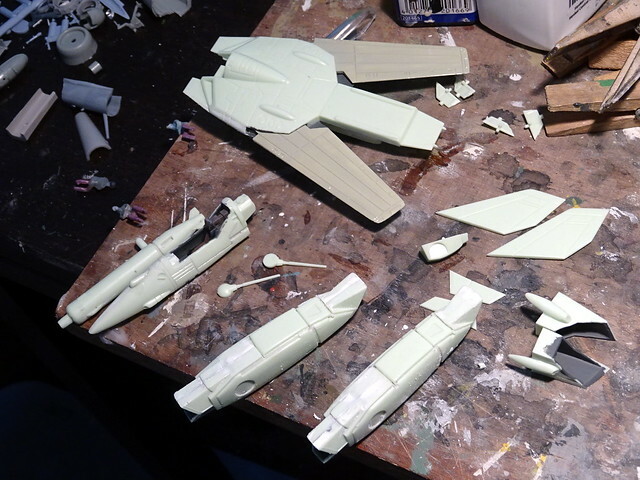 The fairings on the lower legs are home-made and also inspired by authentic VF-1s, even though their shape is different. 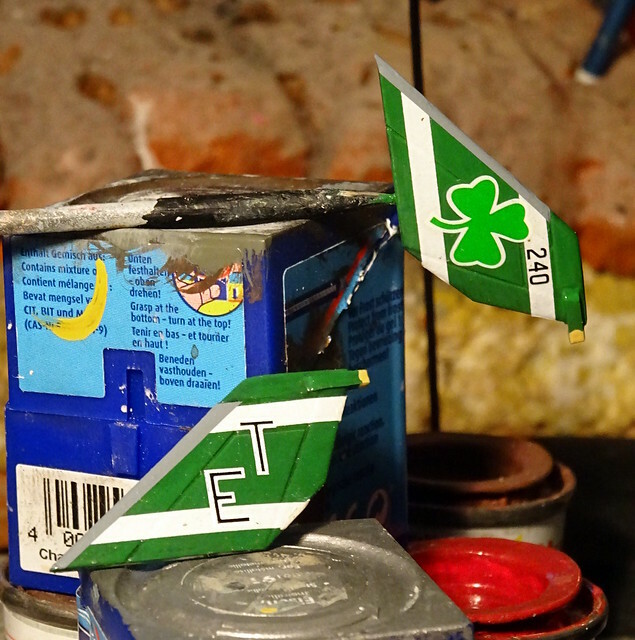 The RHAWS antennae at the tips of the fins are a similar case, improvised with styrene sheet and putty. 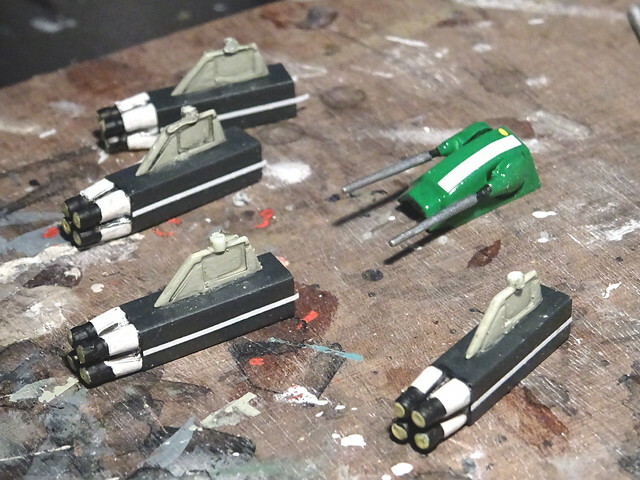 The missile pods were scratched from leftover AMM-1 missile heads and styrene profile, for more ordnance and a more streamlined look than the OOB dozen of AMM-1s on the underwing pylons. Last but not least, the cockpit received an extended dashboard (filling the space between the pilot’s legs) and a pilot figure. Green! This became the theme that would make the idea of RAL 1000 as basic color tolerable. I settled for a uniform livery, inspired by a profile found in a source book (even though it was be basically blue). I wanted a somewhat plausible and convincing look. Basic painting was done with brushes and most of the trim in bright green and white was done with generic decal sheet material. A tedious process, but in the end a convenient solution. 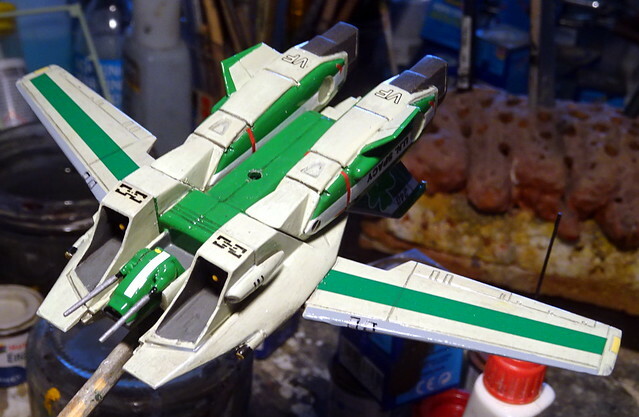 Some very light post-shading (with Humbrol 90) was done, shifting the overall RAL 1000 into a more greenish direction. 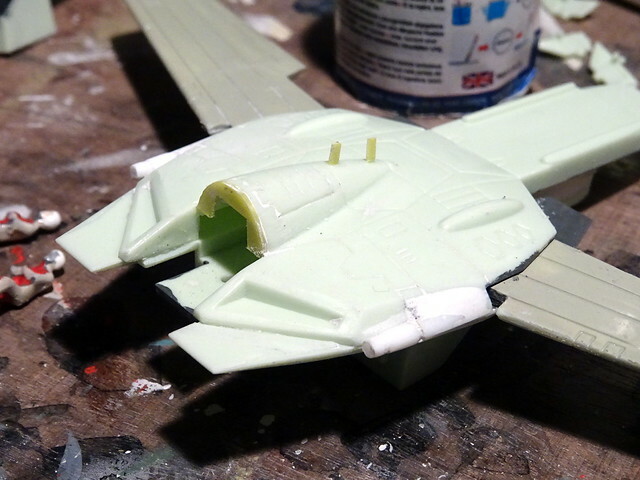 The decals and stencils come mostly from the OOB sheet, but some individual markings were gathered from the scrap box. 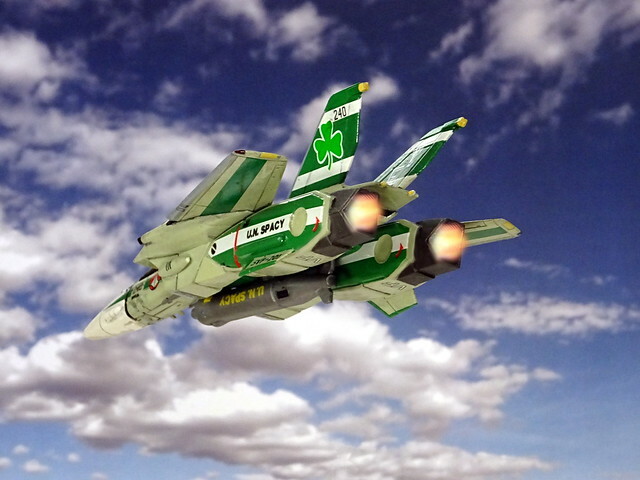 For instance, the green clovers on the fins’ outsides come from a Hasegawa Ki-61, while the USN-style code “ET” on the fins’ insides are tactical letter codes from an RAF SEPECAT Jaguar. 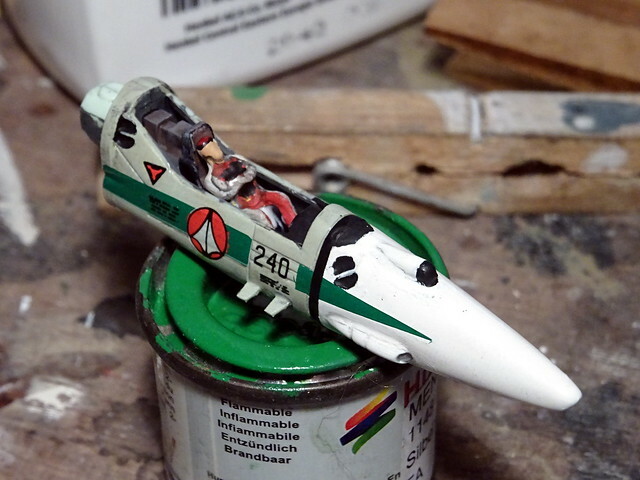 A small and quick interim project – and the RAL 1000-based livery does actually not look as bad as (secretly) expected. 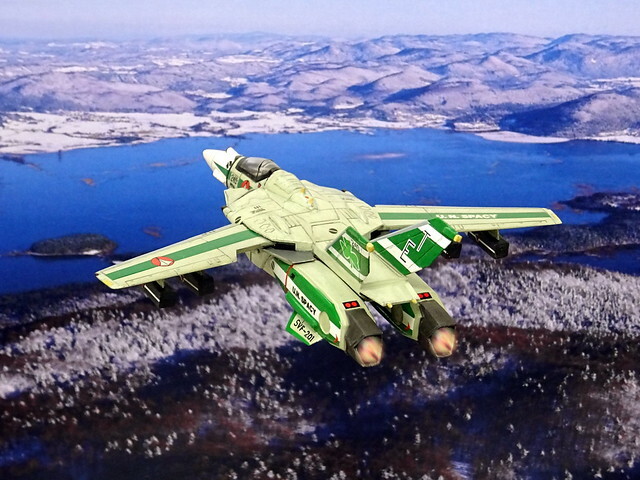 In fact, the green livery is a nice contrast to the red roundels – a bit unusual in the Macross universe, but the Valkyrie looks good! 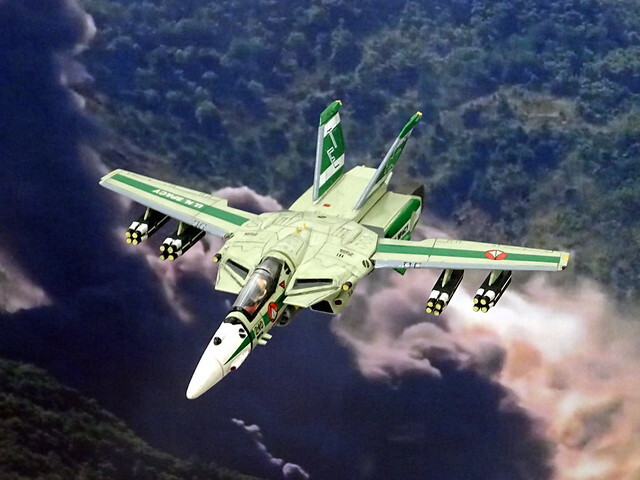 The VF-1 is such a pretty aircraft design, it's sooo Eighties! But I haven't found a scheme that does make it look ugly yet, there's so much potential in these elegant mecha fighters. 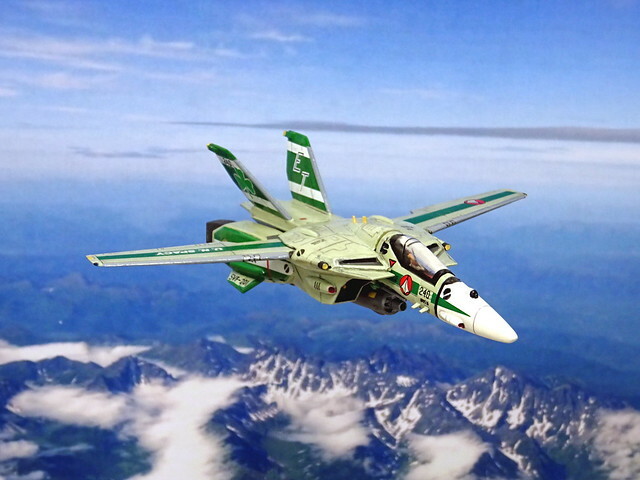 Re: 1:100 VF-1J MLU "Valkyrie" ...and it's green! It looks great. I actually like that green beige. It'll go well as the underside colour for a shades of blue camo scheme.